♥ I was unable to attend Rhinebeck due to a car accident I was in a couple of days before. If you were looking for me, my apologies for not being there. ♥ I’m thinking about hosting a larger craft-a-long in January. Please let me know what you think in the comments here, comments on YouTube, or the Episode 134 thread in the Knot A Podcast Ravelry group! ♥ I’ve finished my monster MoonRover spin! ♥ I started spinning some Hedgehog Fibres top but am unsure I like it so I’m doing a sample first. ♥ Regia sock yarns from HandDyedSockYarn on Etsy. Hello, kittens! It’s been a couple of weeks since I last spoke to you. Today’s intro section is pretty lengthy and explains my absence for the last week, including why Rhinebeck ended up not being in the cards. I also have a couple of finished objects to show you, a WIP that is getting some love, squooshy handspun, and even a little sewing! And of course, I have some pretties to show off. In the intro I have a question for you all about a possible craft-a-long for the beginning of the year: please let me know if you would be interested in playing along. Thank you so much for sharing some of your time with me today! Finally, a quarter in the green for my Fiber Stashdown efforts! I’m trying to not be disappointed by having a net change equivalent to 2.75 standard braids of combed top, but it feels like so little for how much I spun the last three months. I *was* given some amazing fibery gifts by friends which heavily skewed this number, but Fiber In is Fiber In regardless of how it got there. There isn’t too much else to say about this portion of my Stashdown efforts, other than I am hoping to do equally as well or somewhat better in Q4. Spinzilla starts on Monday, and I’m hoping to get at least a pound of fiber out of stash. Though, that means my yarn stash will once again grow. I fixed the snafu with Q2’s numbers as best I could. When I looked more closely into it, I realized I definitely forgot to log all of my MDSW-related purchases. *Cue the sad trombone* I logged them all in and fixed that information as best I could. It should be much more accurate now. I also tallied up the damage for Q3, and…it’s high. I knew to expect that since I did so much spinning, and I’m now logging handspun yarn into stash so I can count it back out, but it really smarts to realize how little I’ve been knitting to reduce that number on my own. My yardage out even includes destashing a sport-weight sweater quantity! All things considered, it really isn’t as bad as it feels. I’m hoping in Q4 to be able to keep pace with my handspun stashing or even beat it as I knit furiously on gifts I’ve put off. My Rhinebeck sweater will help boost my number as well. To break Stash Even at the end of this year, I need to knit or destash over 2,900yds out in excess to what comes in to stash. That feels really daunting. Wish me luck, kittens! 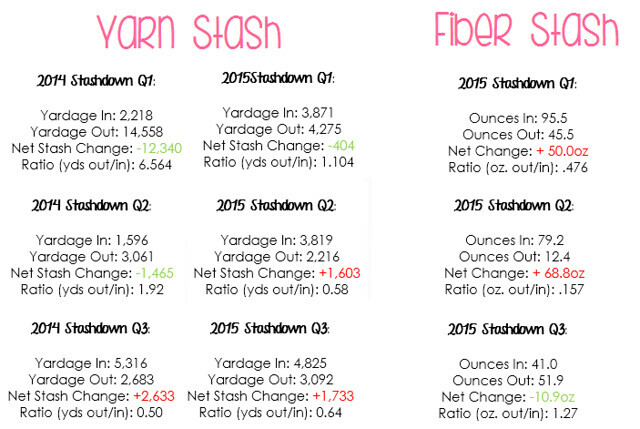 If you’ve been tracking yarn or fiber stash this year, how are your efforts going? How do you feel about them? Thank you for joining me today, kittens! Fall is finally here in the North Country, and that means lots of knitting! I’m really excited that October starts tomorrow; it’s my favorite month of the year. So many good things happen during it! I have a finished object to share, two additional works-in-progress, and I talk about getting ready for Spinzilla next week and what I hope to accomplish. There’s a good chance I will not be recording due to spinning my fingers off; wish me luck! Full show notes can be found on the blog at SewKnitpicky.net, and please consider joining us in the Ravelry group!